Celebrations ringing in 2014 spanned the globe, each with its own particular flavor, such as the edible banana confetti and peach snowballs bursting in the air in London. 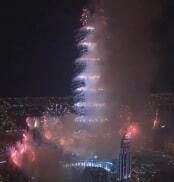 Dubai exceeded all-time records for fireworks, using Burj Khalifa, the world’s tallest tower, as a launching site for the 400,000-firework display which could be seen 62 miles away. In Japan, keeping with Buddhist beliefs, 108 bells rang out to wash away the 108 sins, while in China, a section of the Great Wall had fireworks and lights to resemble a dragon. Australia’s Sydney Opera House was used for the first time in a decade to put on a display using 7 tons of fireworks and viewed live by 1.5 million people. Then, of course there was Times Square. The year has officially begun with a big bang, much hoopla, and fanfare. But, what if you gave a party and nobody came? Today’s real estate market is competitive and the buyers are educated. They know what they are seeking, and have spent a good deal of time surfing the internet and comparing homes available within your market. The first thing a good listing agent is going to tell you is how your home fits within the price structure of your current market. Agents do not control the market. They know that in today’s competitive market, their success in selling your home is tied to pricing. Maybe, though, your home is very special and unique. That’s when your agent has to be able to read the market and figure out the odds that a buyer is going to be attracted to the amenities your home offers and be willing to pay the surcharge. No one wants to go to a party in which there is a steep ticket price for an event that is nothing special, or for party favors that aren’t particularly desired. What is special and valuable to you may not hold much worth to a buyer. Staging is crucial before your agent announces the party. Your home needs to be thoroughly cleaned, clutter stashed neatly away, closets and drawers organized, windows washed, the garage swept, and the yard spruced up. Someone needs to walk through the entire property with a “fresh” eye, noting the first impressions from the moment a potential buyer pulls up to the property. Sometimes it’s difficult, as the homeowner, to realize that a newcomer to your home might find a particular piece of art offensive or find your living room arrangement clumsy. Many home sales are determined within the first 30 seconds of the “guest” arriving. Consider how you respond when you attend a party and the music is blaring and of a genre you detest! The marketing of your home is the party invitation. The invitation needs to be in various forms, including the internet, print advertising, and your agent contacting specific agents and potential buyers . You and your agent’s goal is to reach your home’s target audience with the most compelling and alluring reasons of why your party is a “Must Attend.” No one buys a property without first seeing it. There’s a fine balance between presenting so much information and photos on the internet that a potential buyer feels like there’s no reason to spend valuable time actually walking through the home since they’ve already seen it on the internet. The materials have to be informative and enticing. Photography is key, as is the description of the physical home along with reasons that set your home apart. Finally, the day arrives and your home is officially launched. It is on your Realtor’s Multiple Listing Service, the agent’s web site, maybe with your own dedicated web page, and transmitted to many linking web sites such as Zillow and Truila. You’ve done a last minute “fluffing” of the home including placing vases of fresh flowers and baking brownies so the home smells delicious. Now what? Months of planning, anticipation, you are ready and willing, and no one is showing up to your party. What went wrong? Maybe your home has been on the market for the past year, and within that time frame you’ve only had 2 showings. Why? Despite all the preparations, some homes just don’t garner much attention. The real estate market, especially in smaller markets, has inventory levels higher than sales levels. As price points increase, sales decline. You may be all ready to party, but there simply aren’t many revelers. You are waiting for the one right person to show up, and that is a really tough place to find yourself. You have to be perpetually ready for a party that may just be a single couple on an odd day after months of waiting. The tendency is to want to blame your agent. Maybe your agent has told you your home is over priced and you refused to listen? Or maybe your home has such a unique feature that it is akin to a party theme requiring guest to dress as Napoleon. There is a point when you need to sit down with your party planner (your agent) and go over every detail and see what steps are realistic. You may just have to be patient. Timing is everything, as is location, location, location. The Platinum Team loves a good party, filled with fireworks and pizzazz. Most of all, though, we love client satisfaction, so we’ll always try to steer you right each step of the way. We don’t want you wondering where the real party is, and upset because your expectations and the current market are out of sync. At the same time, we want to insure that all party guests are wowed, and we are ready to close the deal.